It's been a while, hasn't it? I haven't had a lot of time for baking or photography recently...but I'm getting the creative juices flowing again. A couple of weekends ago I treated myself to a bouquet of hydrangeas and a little thrifting. From there, it just seemed natural to have a little in home "photo shoot"! 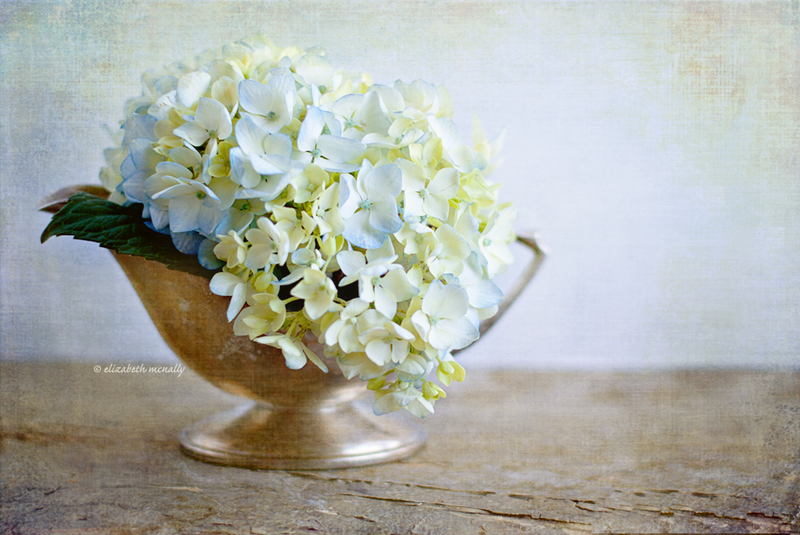 I took lots of lots of photos of this hydrangea bloom and a little silver(plated!) gravy boat I thrifted. I love the look of silver and flowers with soft colors and large blossoms. Can't wait until the lilacs are in bloom. I've recently re-opened my Etsy shop where you can find this little photo if you like it. I love this photo! And the photos in your Etsy shop are beautiful as well. Congrats on opening your Etsy shop back up! Hi Elizabeth....what a beautiful shot ! I must pop over to check out your etsy shop !